Hi! 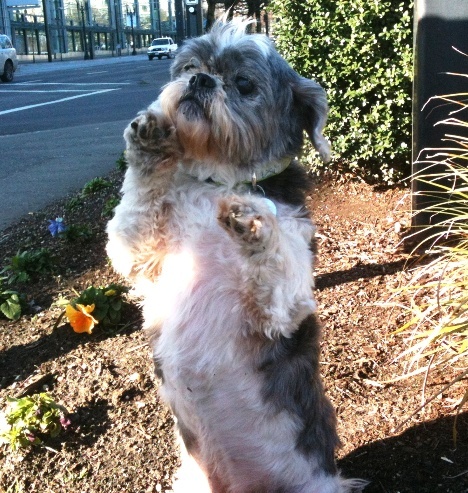 My name is Tinkerbelle and I’m a cuddly 9 year old (approx) female Shih Tzu. “If you like pina coloda’s and getting caught in the rain. If you’re not into yoga (completely optional). If you have half a brain. Then I’m the companion that you’ve looked for. Call Pixie Project so we can escape”… Are you now singing Jimmy Buffet in your head? Adopting me can be that easy. Imagine us cuddled up on the couch, the sounds of the ocean all around us from the radio… I could be your unconditional love. We can go on short walks and you can tell me all about you… Here’s the bonus… I am completely house broken and get along with all other pets. I am slightly hearing impaired so you can repeat the same story over and over again and I won’t mind at all. I’m also sight impaired (approx 60% sight) so I’m looking for a companion with a good personality. Are you just the person for me? Well then fill out an application at pixieproject.org and send it in so we can schedule a meet and greet! I am fixed, vaccinated and microchipped. My adoption fee is $100 and I am currently living in foster care.